6.1. Requirement to Give Way - All vessels except those in Direction 6.5 shall when safe and practical give way to the Chain Ferry. 6.2. Action by Give Way Vessels - All vessels except those as covered by Direction 6.5 when approaching the Chain Ferry when it is displaying a flashing yellow light, shall if safe and practicable take early and appropriate action to allow the Chain Ferry to commence or complete her passage to the opposite bank. Such action may include reducing or taking all way off and allowing the Chain Ferry to pass safely ahead or alternatively, if safe and practical, maintain speed and pass well clear of the forward end of the Chain Ferry. 6.3. Action by Chain Ferry - Nothing shall exonerate the Chain Ferry from taking the appropriate action to avoid a close quarter situation or collision as soon as it becomes apparent that a vessel is not taking action or is unable to take avoiding action as required. 6.4. Regard to Tide and Ability of Give Way Vessel - The Chain Ferry shall have due regard to the rate of the tide and the type of vessels transiting and in particular the ability of all vessels upstream and sailing vessels upwind to take appropriate avoiding action as required by Direction 6.1 prior to commencing the crossing. 6.5. Vessels Requiring an Unimpeded Passage - The Chain Ferry shall give way to all vessels over 20 metres in length, vessels not under command, vessels restricted in their ability to manoeuvre and any vessel that requires an unimpeded passage, provided that such vessels have contacted the Cowes Chain Ferry on VHF Channel 69 and given early indication of their approach. 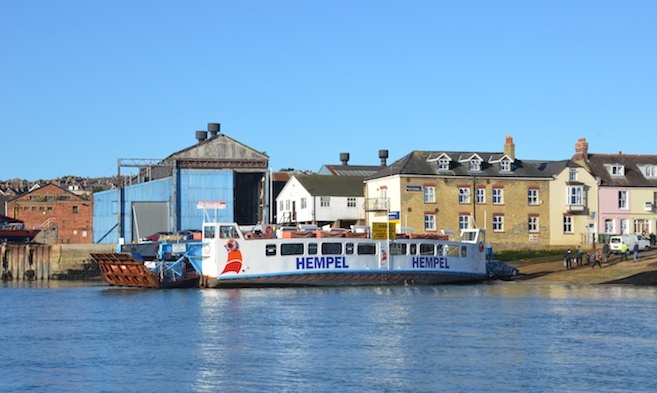 The Master of the Cowes Chain Ferry shall acknowledge and confirm the agreed action. In addition to this VHF call the above vessels where possible shall also sound one prolonged blast when approaching the chain ferry. 6.6. Manoeuvring Light - The Chain Ferry shall by day and by night when proceeding from one bank to the other and 10 seconds prior to doing so, exhibit at the fore-end a flashing yellow light. For the purposes of this Direction the fore-end of the Ferry means the end nearest the side of the River Medina to which the Chain Ferry is proceeding or is about to proceed. 6.7. VHF Watch - The Chain Ferry shall maintain a listening watch on VHF Channel 69 at all times. 6.8. Fog - During fog or any other condition similarly restricting visibility the Chain Ferry shall sound when proceeding from one bank to the other two prolonged blasts on a whistle or a portable foghorn at intervals of not more than one minute. 6.9. Sound Signals - The Chain Ferry may sound five or more rapid blasts on the whistle if he is unsure of the intentions of a transiting vessel or vessels. 6.11. CHC Chain Ferry Operators Certificate - Every operator responsible for the control and operation of the Chain Ferry shall be required to hold a valid CHC Chain Ferry Operators Licence. This licence will be required to be renewed bi-annually subject to the satisfactory compliance with the terms and conditions of the licence.